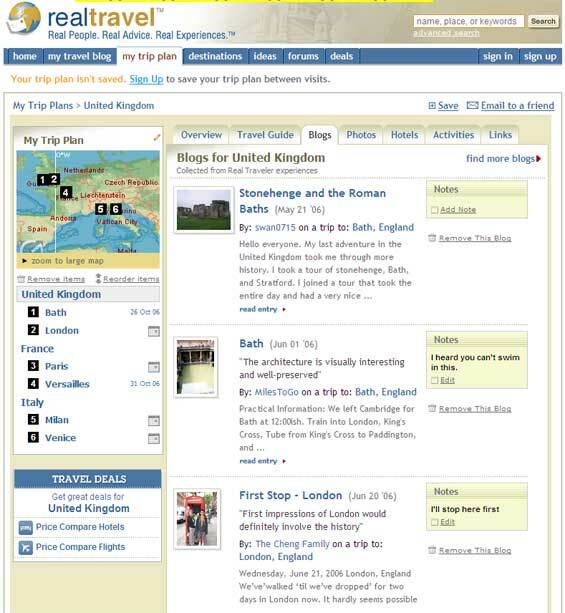 RealTravel has come a long way since we first mentioned them in our Web 2.0 conference roundup last October. They now have very deep travel content – mostly written by users, and some from a recent partnership with Frommer’s. The site has an active community of tens of thousands of frequent travelers who talk about their experiences and freely give their recommendations via blogs, forums, photos, etc. Tomorrow RealTravel will annouce its new My Trip Plan tool, which can be found in the main navigation area. Travel content on the site includes an “add to My Trip Plan” button. Clicking this basically cuts and pastes the information into the My Trip Plan area along with a link to the original content, and this information can then be shared with others for discussion. TripHub and Yahoo, among others, also offer good trip planning tools. RealTravel’s new My Trip Planner actually falls short of those existing tools in terms of pure organizational features. However, the depth of content available from other travelers gives RealTravel a different kind of advantage. And while RealTravel can create better planning tools over time, it will be hard for competitors to compete with RealTravel’s active traveling and content-creating community. All the content on RealTravel (except the Frommer’s Guide content) is drawn directly from user posts and photos that are categorized by location and type. Editors, with the help of some automated classification, and choose the cream of the crop to be featured on the site. Readers can also affect the ranking of posts by voting on them or implicity when they add the content to their trip plan. All this content populates the site’s info on trip ideas, photos, blogs, dining reviews, sight reviews, useful links, and hotel reviews. The blogging platform performs like any other blog (RSS included) except you catagorize by location and type (if it’s a review or not) before you write up the entry. You can’t drop drop images directly in a post, but instead associate some photos with it via an image gallery. You can print these photos out later using Qoop. Readers can comment on posts or leave questions in RealTravel’s location specific forums. RealTravel has accomplished all of this in just one year, and with only $1 million in angel funding. They are a poster-child for the way to run a lean web service, and I suspect a bigger round of financing, or acquisition, will come in the near future.